Terry McBelle checked her bees on Feb 23. She really did it right. Opened the cover and inner cover. Looked quickly. Confirmed she had a good number of bees, looked to see they had plenty of honey. Closed up the hive. The check took less than 2 minutes, a perfect winter check. Nice video Terry. If anyone within 60 miles of me has bee cages. I need them returned back to me by March 15 to ship to California to be filled up. Bob Sitko found this link to a free publication. It is informative and discusses all aspects of basic beekeeping. It is 102 pages long. I have a tentative date for bee pick up. April 11. Watch this blog for further information or any changes. Checking to make sure the queen is alive in her mini cage inside the package cage. When is the last day to order bees? We are allotted some many packages. When they are all sold we are done taking orders. Always order as soon as possible. How many bees are in a package? A pound of bees is roughly 2500 bees. 2 pounds 5000, 3 pounds 7500. Is a 3 lb package better than a two pound package? The advantage of a 3 lb package is obviously more bees. That means comb can be drawn out faster, the bees will cover more brood, and more foragers available for pollen collection. The colony usually expands faster than a 2 lb. Does a Queen come in the package? Yes all packages come with a live mated Queen. All packages are checked to make sure the queen is alive before it leaves our store. What does 1 - 9 mean on the order form? Those are the number of packages at that particular price. 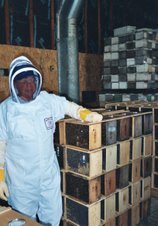 In beekeeping everything is priced on quantity purchased. Do I need to bring my package cages back? If you want your cage deposit back I need all cages back by March 1 if you live within 60 miles of me. I need to send them back to Calif to get filled up. Others can bring them back on bee pick up day and still get their deposit back. Why is the delivery date always tentative? The thing to realize is that this is farming. Beekeepers are at the mercy of the weather and this on occasion can affect the delivery date. Can I pick up supplies on bee day? A beekeeper needs to have all his or her hives set out in a field and be ready with everything before the bees arrive. Supplies can be picked up if pre-ordered two weeks ahead of time. Syrup, pollen patties, fumigilan and feeder pails can be purchased without pre-ordering. Do I have to pick up bees on that day? yes. If you are going to have a conflict in mid April contact me and we can find a way to get you your bees.